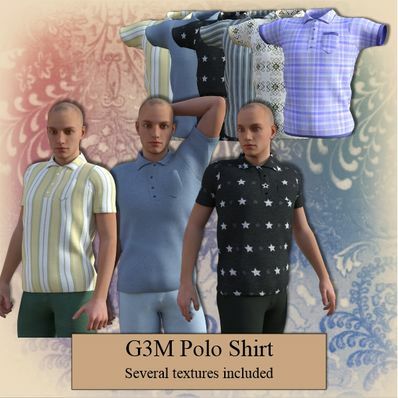 Polo Shirt for Genesis 3 Male for use in Daz Studio 4.8. Thank you so much for all fantastic creations. This is my favorite of your G3M, thanks you!!! Great Shirts! Thank you so much! Thanks very much for all the things you make and give for free. Happy Holidays to you and yours. Happy Holidays Always! Gracias, Feliz Navidad! Just practicing 2nd language. :) Just what I wanted. Hope to modify the textures for button down also. Thank you very much. Happy Holidays! Thank you very much for this nice shirts:)) Have a great week. Very nice, and very useful. Thank you, and Happy Holidays to you and your family! Thank you so very graciously for all your kind work. I haven't commented anywhere else but you always help out so much and there is so many that I could say thank you for but I have accumulated it to here to say thank you for everything. I hope you have the most glorious day that can ever be had... Thank you again. Thank you so much! Very nice Shirt! Huge thanks for ALL of your wonderful creations!! Many thanks! A useful addition for this new character.